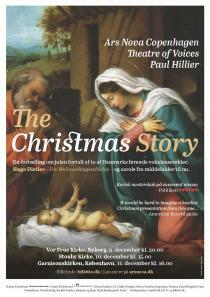 A tale of Christmas told by two of Denmark's leading vocal ensembles, Ars nova Copenhagen and Theatre of Voices. Our Christmas program presents a sequence of medieval and modern English carols, followed by Hugo Distler’s Christmas Story. This fine work belongs to the same genre of choral music as the narrative works of Schütz. Distler’s work takes the beautiful Advent song Es ist ein Ros entsprungen as its musical starting-point, and unfolds the story of Christmas with a mixture of solo chant, choral commentary, punctuated at key moments by the verses of Es est ein Ros in varied harmonic colourings. Medieval English carols have had a strong influence on 20th-century English composers, and perhaps none more so than Peter Maxwell Davies, who died earlier this year. Gordon Crosse (b.1937) belongs more to the Britten school, though he certainly speaks with his own voice, particularly in the large oratorio Changes which established his reputation. Koncerten har modtaget projektstøtte fra Toyota Fonden.